The sun is probably the most important source of renewable energy available today. Traditionally, the sun has provided energy for practically all living creatures on earth, through the process of photosynthesis, in which plants absorb solar radiation and convert it into stored energy for growth and development. Scientists and engineers today seek to utilize solar radiation directly by converting it into useful heat or electricity. To move the world toward sustainability, scientists are continuing to explore and improve ways to tap the vast power of sunlight to make fuels and generate electricity. Now they have come up with a brand-new way to use light -- solar or artificial -- to drive battery power safely. Their "photo battery," reported in ACS' The Journal of Physical Chemistry C , uses light and titanium nitride for the anode. A group of Indian scientists have created a battery that incorporates a titanium nitride-based photoanode in place of a conventional anode, allowing the battery to charge itself using solar or artificial light. 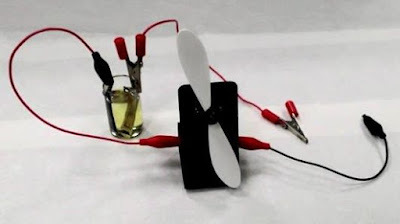 The battery was created by a team led by Dr. Musthafa Ottakam Thotiyl, of the Indian Institute of Science Education and Research. According to the researchers, it's able to fully charge within 30 seconds using normal indoor lighting. It's subsequently able to discharge enough of a current to illuminate an LED or run a small fan, and lasts for over 100 charge/discharge cycles.